This year, Ingenuity’s theme of “Metamorphosis” will serve as an inspiration for participants. This theme is emblematic of the evolution of our organization and transformation of the neighborhood. We are proud to announce the return of IndusTree Alley, Makers Mecca, ARTchiTECHtonica, MOTOmagination Station, Music Meadow and more, in addition to a range projects which exemplify metamorphosis in all of its beautiful intricacy. In 2016, the theme for IngenuityFest weekend was "Awakening," since it was held for the first time at their new, permanent location: The Hamilton Collaborative, 5401 Hamilton Avenue, Cleveland. 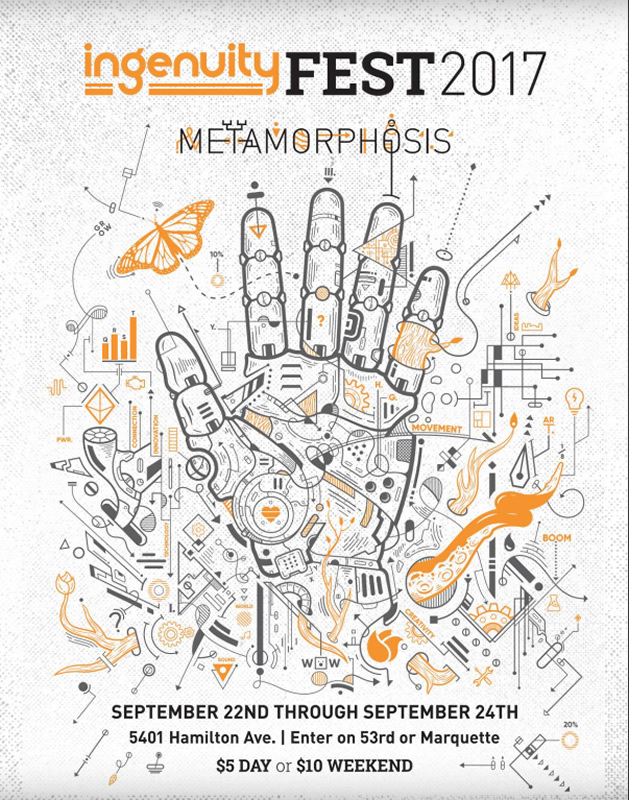 I found it interesting that Ingenuity Cleveland (@Ingenuityfest) chose the theme “Metamorphosis” for IngenuityFest 2017 to reflect how they have evolved into a year-round community hub. What follows are my photos and @sos_jr tweets and retweets from IngenuityFest 2017 weekend. I met a lot of interesting people, and enjoyed a lot of great entertainment. I encourage you to learn more about the creative people involved -- it would be worth your effort. If you want to give feedback and thanks to the organizers, please see their: IngenuityFest 2017 – Take Our Survey! See the online verion of the IngenuityFest 2017 Program here. UPDATE October 17, 2017 - Thank you to Ingenuity Cleveland Development & Marketing Associate Annie Weiss for emailing me the PDF version of the official IngenuityFest 2017 Program! I have written five blog posts about past IngenuityFests, and addtional posts about Ingenuity Cleveland's events such as their Bal Ingénieux and their partnership with the Cleveland Mini Maker Faire. See all of our past Ingenuityfest blog posts here.